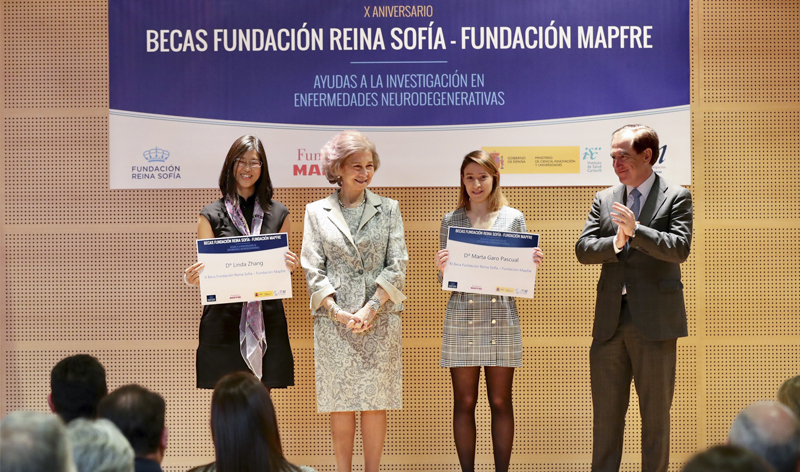 Her Majesty Queen Sofia and Antonio Huertas, president of Fundación MAPFRE, have awarded two research scholarships to young scientists working in the field of neurodegenerative diseases, within an event held at the Centro Alzheimer Fundación Reina Sofía, in Madrid. Sincé its creation over a decade ago, the Fundación Reina Sofía–Fundación MAPFRE program has supported more tan 12 applied clinical research projects andinternational scientific training through grants totaling more than 350,000 euros, which has enabled its beneficiaries, to undertake placements of up to a year at cutting-edge centers worldwide, such as Mount Sinai (New York) or the Royal College of Surgeons (Dublin). This program is the result of a collaboration between these two institutions and Fundación CIEN (Neurological Diseases Research Center), which has been supporting young scientists since 2006 in their research into neurodegenerative diseases, and particularly Alzheimer’s. Antonio Huertas, president of Fundación MAPFRE, addressed the fact that “medicine has made tremendous progress in the last few decades and has achieved things that only a few years ago seemed inconceivable”. However, he stated that there are still “challenges for which we need to step up our efforts, such as Alzheimer’s, the memory loss disease. This is an unresolved issue which we are steadily making headway with thanks to the excellent research teams who are fighting on a daily basis to uncover the key to reversing this disease process. ”. In this respect, he is “extremely proud” to be contributing to fighting degenerative diseases through their more than ten-year collaboration with the Fundación Reina Sofia. “Foundations such as ours, he pointed out, will always be pushing medical and scientific research forward. It is part of our DNA and something which society expects of us”. The award ceremony was also attended by Raquel Yotti Álvarez,director of the Instituto de Salud Carlos III; Enrique Ruiz Escudero, Health Minister for the Madrid Community; José Luis Nogueira, secretary of the Fundación Reina Sofía, and Mª Ángeles Pérez, director of Fundación CIEN. The declaration of research into neurodegenerative diseases as an event of exceptional public interest for the years 2019 and 2020 has also been made public during the course of the granting of aid under the programme. The event “Neurodegenerative Diseases 2020. International Year of Research and Innovation” (Neuro 2020), promoted by the Reina Sofia Foundation and the CIEN Foundation, aims to raise public awareness of the importance of promoting research into neurodegenerative diseases, encouraging the attraction of financial resources to finance a series of initiatives, dissemination actions and applied research projects. The declaration entails a series of tax benefits to which companies, institutions and individuals who collaborate with the initiatives may benefit, both financially and through advertising and dissemination.